New 16th Edition Now Available! 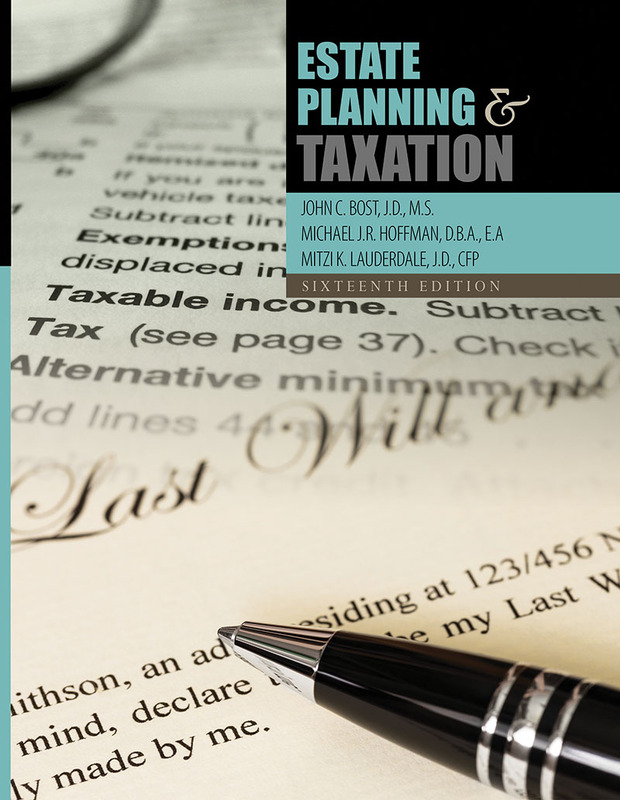 Designed to be used in an academic program, Estate Planning and Taxation presents a concise, integrated overview, highlighting the essence of concepts without confusing the reader with every technical qualification and reference - a problem which has impaired the readability of many books in the field. Is written for the professional or student pursuing a career in financial services, taxation, or law in which estate planning and estate and gift taxation is but one of several principal areas of practice. Is chock-full of pedagogical devices – including examples to clarify concepts, end-of-chapter questions with solutions, glossary, tax and valuation tables, and more. Draws heavily on primary sources of the law, both Internal Revenue Code and cases. Is adaptable to law school courses in estate planning and taxation, giving the law student a strongly quantitative slant that is often overlooked in traditional law books, even those dealing with taxes. John C. Bost is professor emeritus, Department of Finance, College of Business Administration, at San Diego State University. He has taught courses in estate planning, the legal environment of business, and real estate law. He has a Juris Doctorate from Hastings College of the Law, University of California, a Masters in Taxation and a Board of Examiners for the Certified Financial Planner Board of Standards. He has published numerous articles on estate planning and was a co-author of West's Federal Tax Research. He was certified by the State Bar of California Board of Legal Specialization as a Taxation Law Specialist for twenty years and as a Probate, Estate Planning, and Trust Law Specialist for ten years. He was appointed by the California Bar Associations's Board of Governors to the Taxation Law Advisory Commission, serving a three year term.